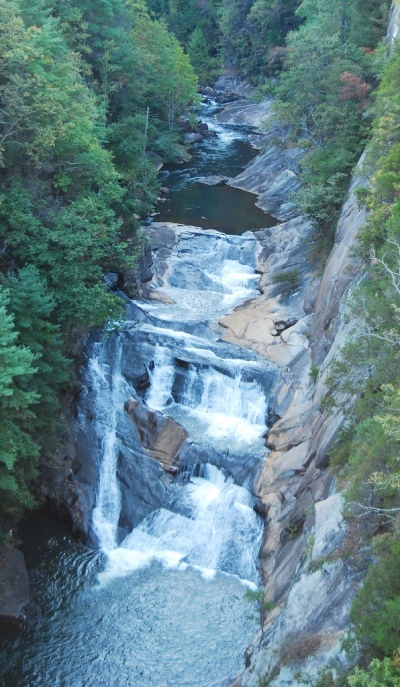 The 2,711-acre Tallulah Gorge State Park includes not only the park itself with its hiking and biking trails and overlooks, but also several other cultural and recreational sites. The park is home to one of the most spectacular canyons in the eastern United States. Tallulah Gorge is two miles long and nearly 1,000 feet deep. Visitors can hike rim trails to several overlooks, or they can obtain a free permit (limit 100 per day) to hike down to the gorge floor. A suspension bridge sways 80 feet above the rocky bottom, providing spectacular views of the river and waterfalls.